I've seen the name spelled: Pawpaw, PawPaw, Paw Paw & Paw-Paw. Some people love the taste of this fruit, and some find it awful. Turns out, it is a highly variable fruit in taste. There seems to be a consensus that the further north it is found in its range, the less tasty it is. 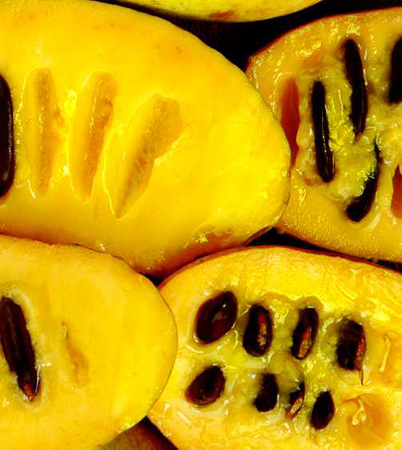 At one time, back in the 1800's, it was a common fruit available in markets when in season. The ripe fruit does not last long, and that doesn't work with the modern grocery store system. If you live in an area where they are common, you may be able to find them at farmer's markets when in season. 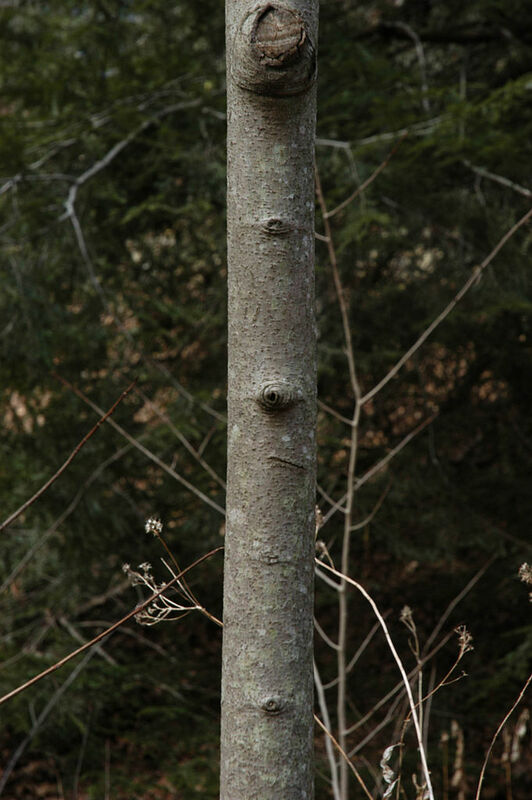 I have found the trees in Southern Ontario, though they are not common. I guess a better description in most cases is large Shrub. The tree/shrub and leaves have a look that is easy to spot at a distance. The way the big leaves hang from the tree give a visual pattern sort of like a layered pattern of scales on a fish or shingles on a roof. Honestly, the way it always strikes me is; it's like the visual equivalent of a humming sound. They form clonal colonies by spreading from the roots, so usually there is a patch of them. You just expect flowers to smell nice - this one smells likes rotting meat, but the smell is weak, it's not overpowering when you come up to the flowering tree in spring. Makes sense when you realize it uses flies and beetles to pollinate the flowers instead of bees. 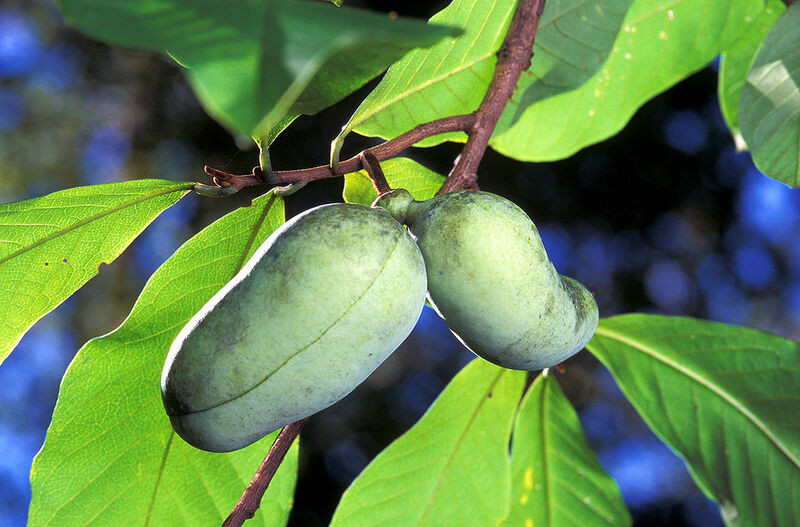 Whether planting by seed or buying them, make sure the ones you buy or plant were grown in your area - there are many varieties of Paw Paw that are adapted to local climates and conditions (and this explains the different taste in different regions). The shrubs will start to produce fruit when 5-6 years old assuming they are healthy and in the right conditions. You need at least two for pollination. There are three ways to get them. One is by growing from seed. Two is by buying a 1 year old seedling. Three is by buying a 2 year old grafted shrub in a pot. If done by purchasing a seedling or starting by seed, be aware the fruit of the new tree will not be exactly the same as the one it came from - it could be better or not as good. If you buy a grafted shrub, the fruit taste will be known to be good, so this is the way to go if you can find them this way and don't mind spending a bit more up front. Seeds: Starting by seed is a bit complicated, but you can do it. First, you need to stratify the seed - but NOT in the freezer as is most often the case. You stratify them in the fridge in with lightly moist (not wet) peat moss in a jar, baggies or plastic container. You need to do this as soon as you take it out of the fruit. If you let the seed dry out, it will die. After sitting in the fridge for the winter put them in loose soil of the right pH (5.5 to 5.7) about 2.5 cm (1 inch) deep. This needs to be in a warm spot 25-30 degrees Celsius (75-85 Fahrenheit). Keep moist, but make sure it is not soaking wet. 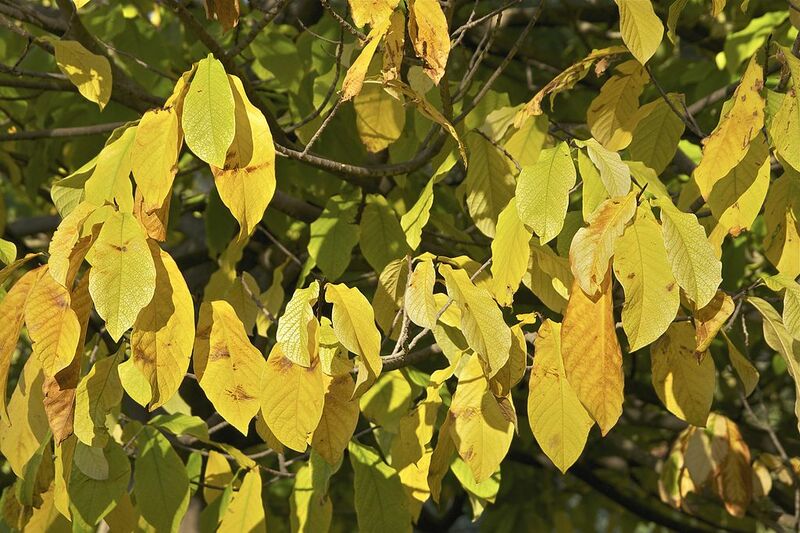 If you do start them in a pot, make sure it is tall - at least 30 cm (10 inches), as these trees do form taproots. You can try planting the seed in the fall right after removing from the fruit - it might work. I would advise putting a quite deep mulch over it for the winter, and removing most of it in the spring after any chance of frost. Transplanting: Don't bother trying to transplant one - even a small one, they just tend to die as the root system is so breakable. Also, they form taproots, and trees that form taproots are notoriously difficult to transplant. Soil & Site: You need to be in a climate zone 5 to 8 to grow them. It will grow in a wide range of conditions, but if you want it to set fruit, you need to be where the soil is moist, well drained, slightly acidic to neutral (ideal is 5.5 to 5.7 pH), in full sun (see paragraph below), and where there is a fair amount of rainfall in the spring and early summer. Also, don't plant this one right by where you want to sit out on the deck and eat since it attracts beetles and flies to pollinate the flowers. As I said above, this one needs full sun to produce the most fruit, however this is not the full story: when young, this shrub needs shade, as full sun will kill it. There are different ways of dealing with this, such as starting in a large pot in a lightly shaded area, and transplanting to full sun when the plant is a couple of years old, or building a simple shade system over it where it is to be planted. It could be as simple as an old umbrella poked into the ground where it is planted. I've seen ragged old ones that are the screen type that let 50% of the sun through in the garbage many times, and one of those would be ideal. Maintenance: When planting ones purchased in pots - whether a seeding or graft, make sure they never dry out after planting. Also, mulch around them to keep the soil moisture in and spread a little bit of 10-10-10 fertilizer around them a couple of times early in the season. As you may have guessed by now, these are not plant-and-forget trees/shrubs. There is one more thing you need to do. You need to be the pollinator most of the time. They are renowned for not being able to pollinate without help. Use a cotton swab or small paint brush and rub some of the yellow pollen from the anther of one shrub's flowers to the stigma of the other shrub's flowers. If you find you get a lot of fruit per shrub, thin them out to let the ones remaining get larger. Harvesting: Usually ripe later September to mid October. The fruit turns from green to yellow or light orange. The fruit goes from being hard to soft - like a peach or pear does when ripe. Don't keep for too long, as they go off fairly quickly. Best to eat within two days of picking, though they can last up to two weeks in a fridge if picked at the beginning of ripeness. Don't pick green and expect it to turn ripe, they have a habit of going from green and hard to rotten, bypassing the ripe stage. When the fruit is ripe, the inside flesh can be white, yellow or light orange depending on the variety. Using: Eat fresh or can be used in recipes that call for Bananas. For instance, instead of making Banana bread, use a Banana bread recipe and substitute Paw Paw. Flowers: 3–5 cm (1 to 2 inches). An inner set of three petals, and an outer set of three petals, often folded back somewhat, a greenish yellow center. 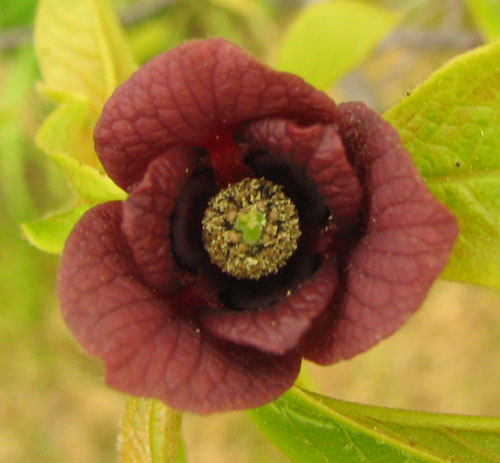 The petal color is a purplish to reddish brown with a not too powerful foul odour. Flowers in spring with or before leaves. Fruit: Very large - 5–16 cm (2 to 6 inches) long and 3–7 cm (1 to 3 inches) wide, weighing from (20–500 g) (3/4 to 18 oz) berry that is yellow-green, with few to many brown seeds 15–25 mm (1/2 to 1 inch) diameter. First they are green, then ripen to a yellow green to brown in September or October. Color of flesh of fruit ranges from the color of banana flesh to a peach flesh color. Ripe Paw Paw flesh has a ripe banana texture. Pictures of the Paw-Paw on the web here (Google images) and here (Bing images). 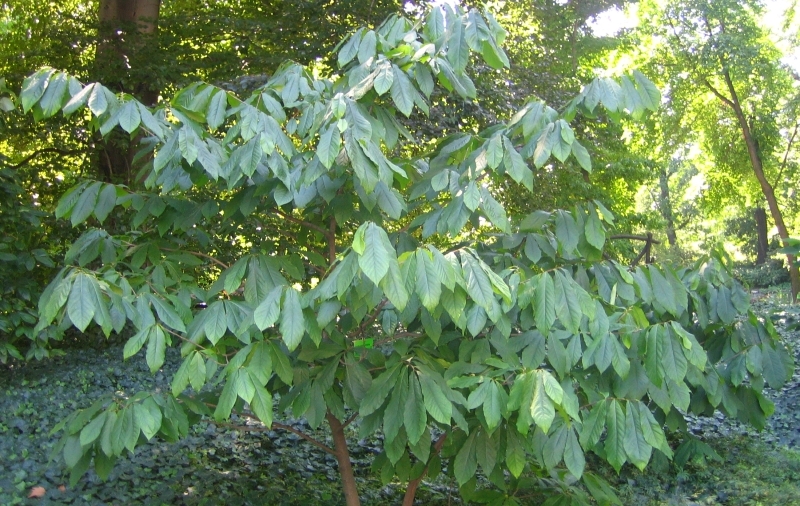 Paw-Paw (Asimina triloba) range. Distribution map courtesy of the USGS Geosciences and Environmental Change Science Center, originally from "Atlas of United States Trees" by Elbert L. Little, Jr. .